The Panic of 1907 was a financial crisis, which almost left the nation’s banks in ruins. 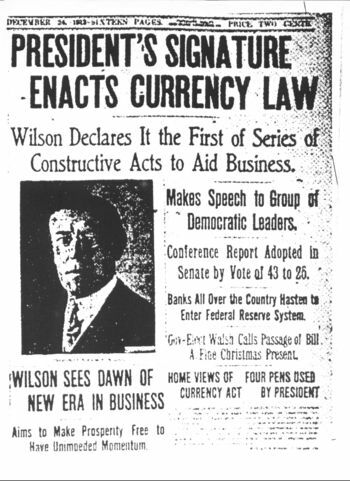 Therefore, on December 23, 1913, President Woodrow Wilson signed the Federal Reserve Act. This act established the Federal Reserve System, the nation’s very own bank that would overlook and monitor the nation’s monetary policy. The president has the power to nominate the central board, which in turn would monitor the 12 regional banks spanned across the country. The Federal Reserve has the abillity to issue money, control interest rates, and bail out banks in slump.